This beaded necklace is the first finished item in my Peyote Bobbles Series. If you have been following the series, which starts here, you can see it's changed dramatically from that little peyote stitch flower that started all this. You can also see how my embellishment has changed from the samples I did, it's now much simpler and more subtle. To bead it you simply work back around the rope after its finished, adding single beads. I also devised different bobbles for the ends of the rope, these are more bell-shaped and I felt they finished the piece better. As the instructions were quite complicated, all the words needed testing. So when checking if they made sense and were accurate I began a new necklace. You can see the result here. 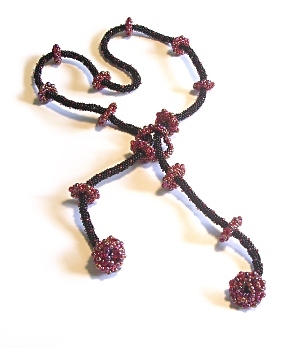 The development of the necklace, and some of the subsequent pieces in the series, was written up as an article and published in the September 2004 issue of the Beadworkers Guild journal.